ABOUT THE PROGRAM: It’s been nine years since The Supreme Court issued its Citizens United Ruling. While we know campaign financing has increased exponentially, what we don’t know is where all the money’s coming from. Dark money, money from non-profit political action committees (PACs) that do not require source disclosures, has become more prevalent in state and local office campaigns. What can we do, if anything, to shed light and stem the flow. 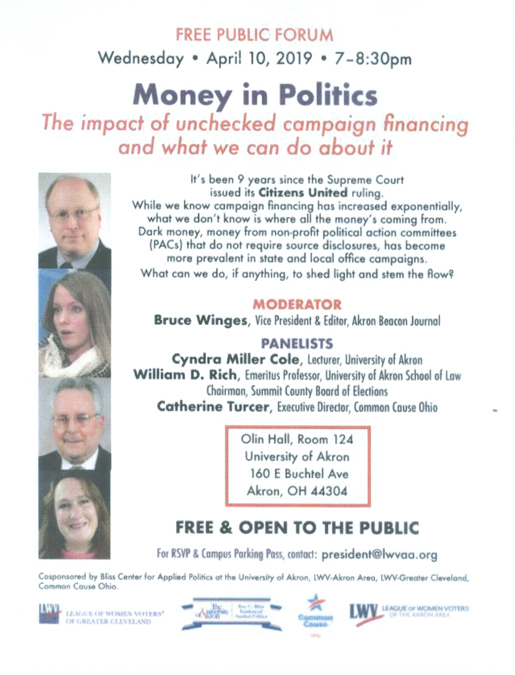 Co-sponsored by The Bliss Institute of Applied Politics, University of Akron; The League of Women Voters of the Akron Area; The League of Women Voters of Greater Cleveland; Common Cause Ohio.